We are in the midst of an oil and gas boom....again. There have been several cycles of boom and bust in Southeastern Ohio and adjacent areas of West Virginia. The late David McKain, oil industry veteran and local historian, documents in his book Where It All Began that this area truly had a pioneering role in the oil and gas industry. 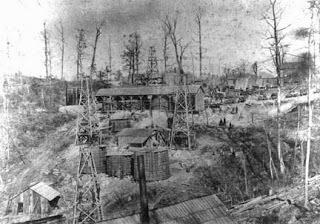 A few early oil wells highlight the importance of our area in the early oil and gas industry: The Thorla-McKee wells in Noble County OH, and wells near Macksburg and on Cow Run in Washington County OH. In a future article, I will discuss some of the early activity in nearby West Virginia. First, some background: The earliest reference to oil in America was in the 1600s. Seneca Indians knew of "oil springs" in southwestern New York and western Pennsylvania. There were other references to oil springs in correspondence and maps of that period. One map by the French labels a spring as "Fountain de Bitume." Locally, oil roots trace back to the late 1700s. Thomas Jefferson witnessed a Wirt County WV burning natural gas vent in 1781. George Washington owned property with oil and gas deposits on the Kanawha River and visited it in 1775. His will described it as being acquired "on account of a bituminous spring which it contains, of so inflammable a nature that it burns as freely as spirits...."
Until the mid-1800s, the search was for salt, a valuable commodity in early America, used for food preservation and flavoring. Salt and brine were usually accompanied by oil oozing out of the ground and by natural gas vents which burned when ignited. These oil and gas byproducts were a nuisance; their value had not been realized yet. 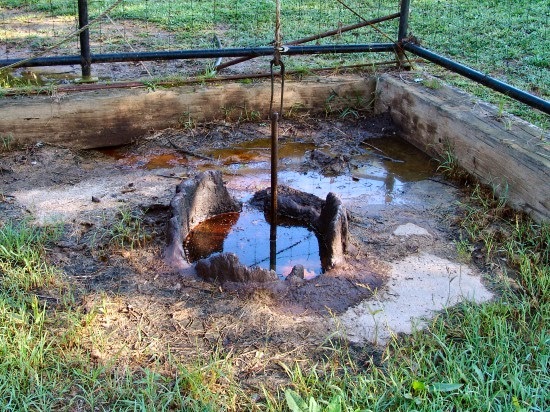 The Thorla McKee well in Noble County is believed to be the oldest producing oil well in North America. The first well was drilled for salt in 1814 using the spring pole drilling method to a reported depth of 200 feet. Silas Thorla and Robert McKee were entrepreneurs who wanted to start a salt works. The well struck the sought-after brine - and oil as well. A second well was drilled in 1816 to a reported depth of 475 feet. 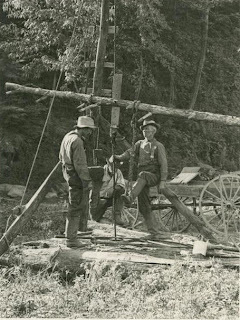 Spring pole drilling method used to drill early salt and oil wells. Worker(s) repeatedly “kicked down” the drilling implement into the hole while the spring pole sapling (appearing as horizontal log in photo) pulled it back up to so it could be kicked down again. From American Oil and Gas Historical Society. The salt works at the well site thrived. The brine/oil mixture was placed in barrels, allowing the oil to separate and float on the surface. Oil was soaked up using blankets, then wrung from the blankets. The primitive oil recovery method copied that used by Seneca Indians. Some oil thus recovered was sold for medicinal purposes as "Seneca Oil." The brine was boiled in kettles to recover the salt. Thorla McKee 1816 well with remains of the original sycamore log casing. From ohiomemory.org. There was natural gas present, also, which often created a safety hazard. Every week or so, Old Faithful-style, the well would "blow off" gas, creating a 40-50 ft. high geyser of salt water. John McKee told the story of a spectacular night time encounter with natural gas at the well. Robert Caldwell was working the salt kettles one night and needed more brine from the well. Usually that operation was done during daylight. He used live coals for light, placed on the platform above the well. One of the coals slipped through the platform floor and dropped near the well. That ignited the gas, creating a huge fireball and a thunderous noise heard miles away. McKee said "Robert Caldwell was not hurt, but a worse scared man was never seen on Duck Creek." The resulting fire ignited the oil, causing it to flow into the creek, creating the spectacle of a half mile floating inferno with flames reaching tree top height. The 1816 well survives today, at Thorla McKee Park at the intersection of state routes 78 and 564. On October 7, 2014, the 200th anniversary of the first well was celebrated with a festival and dedication of the park, operated by the Noble County Historical Society. Ohio's first well drilled exclusively for oil was drilled near Macksburg OH in the autumn of 1860 on land that James Dutton and two others had leased. They struck oil at a mere 59 ft. depth which flowed at 100 barrels per day. Dutton's investment return was astronomical. They had leased the land for 99 years for $100. At 100 barrels per day of oil then worth $10, the well generated $1,000 in a single day. Dutton was so excited that when asked how his sick wife was doing, he exclaimed "flowing one hundred barrels a day!" 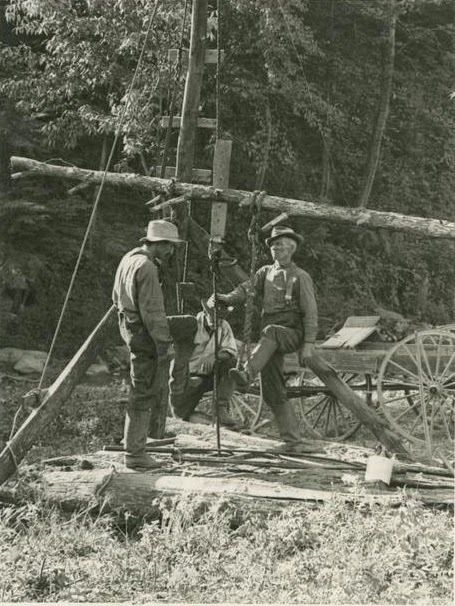 Months later, drilling also began in early 1861 on Cow Run in Lawrence Township, Washington County. Why Cow Run? The story goes that John Newton was in his office at the Harmar Bucket Factory reading aloud an article about drilling for oil and gas in Canada. Uriah Dye, a worker at the factory, overheard the reading. He told Newton that he (Dye) had a gas spring on his property on Cow Run. They investigated the gas spring, then sprang into action themselves, so to speak. They formed a business entity, then obtained a lease in February 1861 from Uriah Dye and Samuel Dye. They began drilling using the spring pole method. The first well on Uriah's farm was dry. Unfazed, Newton grabbed a shovel and said "C'mon boys, I'll show you where to get an oil well!" He walked over to the Samuel Dye lease and picked a spot where gas bubbled out of the ground. He dug a pit with the shovel and the next day it was full of oil. They began drilling again. The well struck oil at 137 feet and yielded 50 barrels per day. That oil was moved to Marietta in barrels by wagon and shipped to St. Louis to a refinery. Scene from nearby 1860s WV oil field – similar to Macksburg and Cow Run. From Oil and Gas Museum web site. Inevitably, though, the boom times faded. But activity has often started up anew as new discoveries or better recovery techniques developed. Today’s current wave of shale oil drilling is a good example of the latter, using horizontal drilling and new fracking methods. We can be justifiably proud of our local area’s role in the development of the oil and gas industry. It has been a cornerstone of the local economy since the earliest days. Let's hope the current boom moderates into a more sustainable “Goldilocks” activity level rather than becoming another bust.